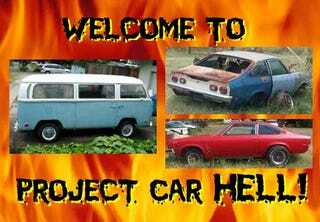 Project Car Hell: Turbo Corvaired Bus or Cosworth + GT Vegas? Project Car Hell: Rotary Dilemma! We like turbocharging, of course, and everyone knows we like Corvairs. Since it goes without saying that the Funk Factor of the VW Type 2 is quite high, combining a turbocharged Corvair engine with a '71 VW Bus... well, how can you resist? And hey, the seller only wants 950 clams for it! OK, killjoys, skip to the part in the description that says it hasn't run since George Herbert Walker Bush was president, and don't forget to wring your hands over the spark plug that got blown out of the cylinder head. The rest of us will overlook those quibbles, as well as the rust-through around the windshield and go straight to the good stuff: '65 Corvair Corsa turbocharged engine, with limited-slip diff, and a whole bunch of spare parts. Some of you may be hesitant to get a Type 2, what with the whole patchouli-scented hippie stigma and all. And that's fine, because you'd probably be happier screaming down the road in your high-revving Cosworth Vega anyway! For the earth-shatteringly low, low price of... well, the seller doesn't say, you could get a '72 Cosworth Vega plus a '76 Vega GT! The seller isn't so strong in the written-language department, so we're a little puzzled by the intended meaning of "have kit for 76 from summit." But no matter- not when you could have a two-for-one Vega deal for a no-doubt-cheap trade. Sure, the Vega made ZAZ build quality look rock-solid, and we can't even tell if these cars even have engines, but that's why we call it Project Car Hell, right? Just keep saying the magic word "Cosworth" to yourself and you'll be fine. Thanks to Brandon for the tip!